Problem Gambling: Let’s Bring the Problem out of Hiding | The Danya Institute Inc.
My name is Bill LaBine. I am the executive director and clinical supervisor at the Jackie Nitschke Center in Green Bay, WI. Green Bay has three casinos, all located within three miles of my home; I pass one daily on my way to and from work. I am saddened when I drive by the casino early in the morning. I see many cars that have been parked there through the night. I know the tired, depressed, shameful walk from the casino door to my car. I know the feeling of having to work all week to pay off the credit card withdrawal from the casino ATM—and blaming the credit card company for charging high withdrawal fees. I know the feelings of isolation and shame of this secret world. I also know the frustration of telling myself I would never gamble again, only to have the obsessive thoughts and cravings overtake me by week’s end. The Jackie Nitschke Center is located in downtown Green Bay. All taverns, many restaurants, and some gas stations have video slot machines hidden in a corner. I have worked with clients that gambled through local bookies. Many businesses and taverns have a variety of baseball and football pools. When I go for a lunch walk, the neighborhood is littered with empty vodka bottles, beer cans, empty drug baggies, and state of Wisconsin scratch-off lottery tickets. It’s alarming to see the amount of this litter that accumulates over the winter when the snow begins to melt in spring. This blog post has been incredibly difficult to write. I am again trying to identify new sources of revenue to keep our treatment center open, and writing this blog post has reminded me of the depth and mostly hidden destruction of gambling addiction. I have had to come to terms with the fact that even though I am not gambling as I did prior to entering recovery from alcohol, drugs, and (I thought) gambling 21 years ago, I have continued to gamble, just in different ways. Betting a few bucks on the dirt track races, family football pools on Thanksgiving, non-profit fundraising raffle tickets, video games, Ebay auctions, rummage sales. Or even just being the fastest car through a triple roundabout near my home. It all comes down to trying to gain something (could be an emotional response) for less than my investment, which is the definition of gambling. It’s easy to rationalize: I was only gambling a few bucks vs. several hundred. And I would give in, just to fit in. The truth is that gambling is gambling: the adrenaline rush, the excitement, and the competitiveness are the same no matter what the stakes. I really believe it to be a spiritual illness, and my daily choices are directly related to the quality of my relationship with my higher power. When spiritually fit, I am focused on giving and helping, not on demanding or wanting. As a treatment professional, I have participated in several trainings on treating pathological gambling. We have not been able to offer treatment for problem gambling at The Jackie Nitschke Center, as we are licensed to treat only chemical addictions. I am pleased to see the DSM-V reclassifying pathological gambling as an addiction rather than an impulse control disorder (a mental health diagnosis), due to growing scientific literature that shows that problem gambling has the common elements of a substance use disorder. This should bring more attention to potential gambling problems in people with—or at risk of having—a substance use disorder. With the new classification, substance abuse counselors will be able to openly discuss gambling issues with their clients. I challenge all addiction treatment professionals to talk about National Problem Gambling Awareness Month with your clients and explore just how devastating their gambling activities might be. Let’s bring the problem out of hiding. 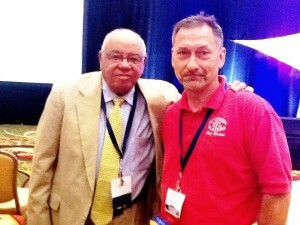 Bill LaBine (r) with keynote speaker Herman Boone at the NIATx Summit 2012, New Orleans.Bill LaBine, MSW, is Executive Director and Clinical Supervisor of the Jackie Nitschke Center, Inc. a non-profit substance abuse treatment facility in Green Bay, WI, providing a full continuum of care to adult clients and their family members. LaBine has been employed at the Jackie Nitschke Center since 1995, working as a residential assistant, cook, counselor, maintenance person, assistant director, and since 2005, executive director and clinical supervisor. Since 2003, LaBine has led a variety quality improvement and leadership development projects with NIATx/Paths to Recovery. He has also assisted the State of Wisconsin since 2005 with the Wisconsin STAR-SI Program – as a member of the state management team, presenter, coach, peer mentor, and agency grant recipient.